We're not even halfway through 2018 yet there's already been several contenders for album of the year. 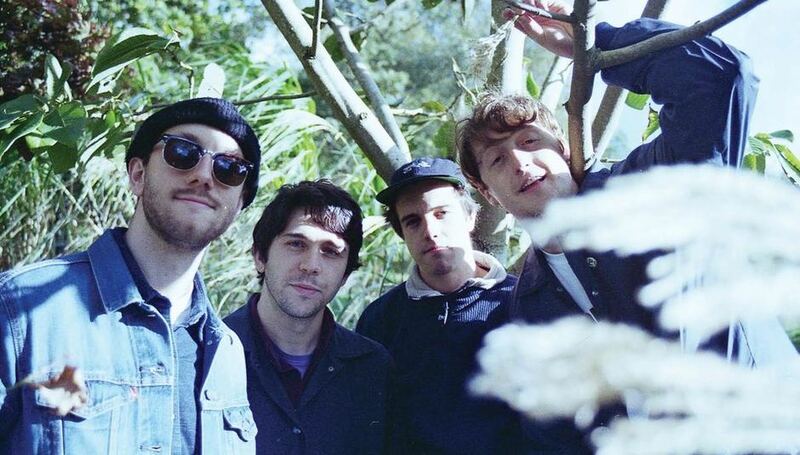 One of those just happens to be 1,2, Kung Fu, the debut from Cardiff four-piece Boy Azooga. Released on 8 June through esteemed independent Heavenly Recordings, it's a genre-transcending melting pot of styles and sounds that references everyone from Can to Outkast and more besides. Here, singer, guitarist and songwriter in chief Davey Newington talks us through each of the songs that make up 1,2, Kung Fu. I finished writing this song while I was having my Weetabix one morning. It felt like an epiphany because I'd struggled for ages to find homes for the verse, chorus and outro ideas. I felt a big sense of relief when it all came together! The chorus melody is heavily inspired by Jonathan Wilson's song 'Gentle Spirit'. I was going for a Serge Gainsbourg-y drum sound for the second verse when they kick in, really dry and punchy. Eddie recorded a loop of him and I sat on the sofa, tapping on the back of an acoustic guitar and then clapping on the offbeat. That's the loop you hear throughout the song. All the sleigh bells and Mellotron flutes are heavily inspired by the Caribou album Andorra. I came up with the chorus lyrics in the shower and was worried I would forget them before I was dry enough to write them down, so just kept repeating them again and again. I realised that I liked the chant-like style of repeating the lyric so just kept it that way. The song is about death, which is a bit serious, so I gave it a daft name. 'Loner Boogie' was written when I was living on Claude Road in Cardiff. I loved living in that house because it was close to my mates, but there was always some kind of chaos ongoing in the street. The combination of that and the apocalyptic news on TV used to make me feel pretty anxious. There's no hidden meaning in the song, it’s all just about not wanting to socialise or be outside because the world is scary. I had the chorus riff for a while but couldn't find a home for it. I heard 'Hot Water' by King Gizzard and that got me really excited and inspired the verse riff; I quickly came up with some lyrics for the verses. I knew I wanted it to be quite dumb and simple, like an early Stooges song, bratty and frustrated. I like to imagine Calvin, from Calvin And Hobbes, singing the song. I remember limiting myself to only being allowed to use the E string on the guitar when I was writing it. This song is basically just a celebration (rip off) of the late William Onyeabor. Dylan showed me his music a while back and I fell in love. I wanted the percussion to be purposefully a bit too loud, maybe by the usual standard. Loads of Onyeabor's percussion is blaring in the mix, but it makes it sound so live and feely. I wanted to create that feeling of being in the room where the music is being played. The track is mainly instrumental, which is something I always wanted to do. My Dad used to play me stuff like Lalo Schifrin and Henry Mancini when I was growing up and it always stuck with me. Really cool sounding, cinematic instrumentals. The chorus is a mixture of Mellotron flutes and rotor cabinet backing vocals. I love the sound of the vocals on Black Sabbath's 'Planet Caravan', so Eddie recreated that sound for "Ooh" backing vocals. We combined programmed drums with real drums for this track. It was fun making the sound of the 'guitar' solo, it’s actually a Mellotron guitar, but played on the keyboard, which is why it has quite an unusual sound. My friend Jamal has shown me lots of amazing Turkish music and he said that Mellotron guitar makes the song sound like 60's/70's Turkish psych. Fuzz makes everything sound better: so we put some fuzz on it. 'Jerry' is one of the oldest songs on the album. I took inspiration from a song called 'Do I Get So Shy', by Shoes - It's understated and calm with sweet lyrics. I like how the singer is asking questions in the lyrics of that song, as it makes it more vulnerable. My Dad plays the strings that come in at the end of the first chorus and stay until the end of the song. We kept the arrangement really simple so as not to get in the way of the chorus melodies. I really love the Deerhunter album Halcyon Digest; I was going for similar guitars to 'Memory Boy' in the chorus for 'Jerry', kind of hypnotic, repetitive parts. The drums switch to programmed drums when the synths come in on the bridge; I liked the idea of a change of scene for that section. I would love to get an animation done for this song one day! This was the last thing that we made for the album. I saw the Brian Wilson biopic 'Love & Mercy' and thought it was amazing. He's one of my heroes. There is a scene where he takes LSD and lies on the grass, suddenly all of the flowers and life around him start to blossom and the instrumental version of 'Don't Talk, Put Your Head On My Shoulder' starts to play. I heard that and came up with the idea of having the 'Breakfast Epiphany' chorus melody come back and lead in to 'Taxi To Your Head'. Again, my Dad plays strings on this one, he got me into the Beach Boys when I was really young so it was great to have him play on this. This song began as a demo when Eddie and I first met each other. I'm so grateful to Eddie for everything because I know how I want things to sound, but don't know the technicality of how to get there sometimes. He's really patient with me and will nail what I'm after, no matter how abstract the request. This song was a mammoth to finish because I could never settle on anything. It changed a lot from how it started. The lyrics were written when I was about 22. My friends and I all lived close together and we'd go out a lot. It sounds simple, but it was really exciting on a Friday night, when everyone had finished their week, to jump in taxis together, go to town, get up to no good and watch the sun come up. I was listening to lots of Sly & The Family Stone, Van McCoy, early Tame Impala/Pond, SFA, Foxygen and Django Django when I wrote it. It’s a bit chaotic and messy, but hopefully its fun! There's a 'Little Rascals' nod to my cousin Chris in the middle instrumental section. We had a lot of fun recording the final chorus when it all breaks down. I remember Eddie setting up a microphone just above my lap when I was sat on the sofa. I was slapping my thighs and clicking. We layered loads of them and that’s the sound you here on the record. I remember wanting to write a song where the chord structure remained the same throughout. 'The Look' by Metronomy was a big inspiration. I made a loop on Garageband of the chords and spent ages trying out different melodies between verses and choruses. The chorus lyric is a lift from the Kelis/Andre 3000’s song 'Millionaire'. I love that song, so took the "What’s a girl to do?" line. I wrote the rest of the lyrics around the same time as Taxi. 'Losers In The Tomb' is more about the darker side of all that fun though. One of my best mates Steff "Black Maraca" Pringle, who helped engineer the drums on the album, can be heard saying "sweet" right at the end of the track. My Dad gave me a copy of the Patrick Hamilton book Hangover Square when I first moved out. Its the oldest song on the album, I think I was 19 when I wrote it. I haven't read many books, but I read this immediately and loved it. The lyrics are all about the character George Harvey Bone and what happens in the book. My Dad played the strings on this one and it was amazing to hear it come to life once we'd layered everything. George Harvey Bone's character keeps having these schizophrenic episodes called 'Dead Moods' where he loses control and obsesses over killing someone. The repetitive ending of the song is supposed to represent being trapped in one of George's dead moods. I won't give anything else away, just read it! This is a song for my girlfriend. I was really inspired by the Futurama episode 'Jurassic Bark'. It’s a heartfelt episode, where Fry's dog waits until the day he dies for Fry to return to him. The drumming is a mixture of me ripping off Kraftwerk, Caribou, and Can as the song progresses, flipping from drum machines to acoustic drums. This is the moodiest song on the album. It made sense to close the record, with the big Sabbath ending and the "think I’m getting better at goodbyes" lyric. Eddie and I spent a long time on the atmospheric noises throughout the first half of the song. When we listen now we can’t remember how we made the sounds. I feel like this one sums up the record quite well; there's some pretty melodic bits, electronic moments, and then balls to the wall Bill and Ted riffing. Hope you enjoy the album! 1,2, Kung Fu is out now via Heavenly Recordings. For more information on Boy Azooga, including forthcoming tour dates, please visit their official website. Photo by Stella Gelardi Malfilatre.